^ Wanted: Abu Du’a; Up to $10 Million. Rewards for Justice. [8 October 2011] （英语）. ^ Terrorist Designations of Groups Operating in Syria. U.S. Department of State. 14 May 2014 [13 June 2014]. （原始内容存档于2014-05-18）. ^ ISI Confirms That Jabhat Al-Nusra Is Its Extension in Syria, Declares 'Islamic State of Iraq And Al-Sham' As New Name of Merged Group. Memri. 8 April 2013 [16 June 2014]. （原始内容存档于2014-10-06）. ^ Terrorist Designation of Ibrahim Awwad Ibrahim Ali al-Badri. United States Department of State. 4 October 2011 [8 October 2011]. ^ IRAQ: U.S. offers $10-million reward for Al Qaeda in Iraq leader. Los Angeles Times. 7 October 2011 [8 October 2011]. ^ ISIL立伊斯蘭國 號召穆斯林效忠巴格達迪 挑戰蓋達地位. 鉅亨網. 2014-07-01 [2014-07-03]. （原始内容存档于2014-07-14）. ^ Taliban leader: allegiance to ISIS 'haram'. Rudaw. 13 April 2015 [31 July 2015]. ^ 12.0 12.1 Chulov, Martin. Abu Bakr al-Baghdadi emerges from shadows to rally Islamist followers. The Guardian. 6 July 2014 [6 July 2014]. ^ Profile: Abu Bakr al-Baghdadi. BBC News. 5 July 2014 [20 July 2014]. ^ Carter, Chelsea, Hamdi, Alkhshali. Does video show ISIS leader? Iraq works to find out. CNN. 6 July 2014 [8 July 2014]. ^ Lister, Tim. ISIS: The first terror group to build an Islamic state?. CNN. 13 June 2013 [14 July 2014]. ^ Fox's Pirro: Obama set ISIS leader free in 2009. PolitiFact.com. Tampa Bay Times. 19 June 2014 [20 June 2014]. ^ Key Free Syria Army rebel 'killed by Islamist group'. BBC. 12 July 2013. ^ Al-Qaeda in Iraq confirms Syria's Nusra Front is part of its network. Al Arabiya. 9 April 2013 [15 June 2014]. ^ ISIS leader Abu Bakr al-Baghdadi 'killed in US-led air strikes in Syria'. mirror. 14 June 2016. ^ Syrian media claim ISIS leader killed in artillery strike. 11 June 2017 [18 June 2017]. ^ ISIS leader Abu Bakr al-Baghdadi has reportedly been killed in Raqqa, Syria, Daily mail online, 11 June 2017. ^ Russia Says It May Have Killed IS Leader Al-Baghdadi In Air Strike. www.rferl.org. 16 June 2017 [16 June 2017]. ^ Isachenkov, Vladimir. Russia claims it has killed IS leader al-Baghdadi. ABC News. 16 June 2017 [16 June 2017]. ^ White House casts doubt on Russia's claim it killed ISIS leader. Politico. 16 June 2017 [16 June 2017]. ^ Baghdadi death near 100 percent certain: Interfax quotes Russian senator. Reuters. 23 June 2017. ^ Iran Confirms Death of ISIS Leader al-Baghdadi. Iran Front Page. 29 June 2017. ^ Hafezi, Parisa. Khamenei's representative says Islamic state's Baghdadi 'definitely dead': IRNA. Reuters. 29 June 2017 [30 June 2017]. ^ IS confirms death of top leader al-Baghdadi. Xinhua News Agency. 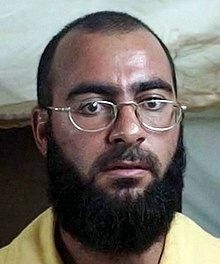 ^ Abu Bakr Al-Baghdadi: Isis leader killed, says Syrian Observatory for Human Rights. The Independent. ^ ISIS leader al-Baghdadi reported dead, though Pentagon can't confirm. Fox News.